Gravity – Insight. . . ! 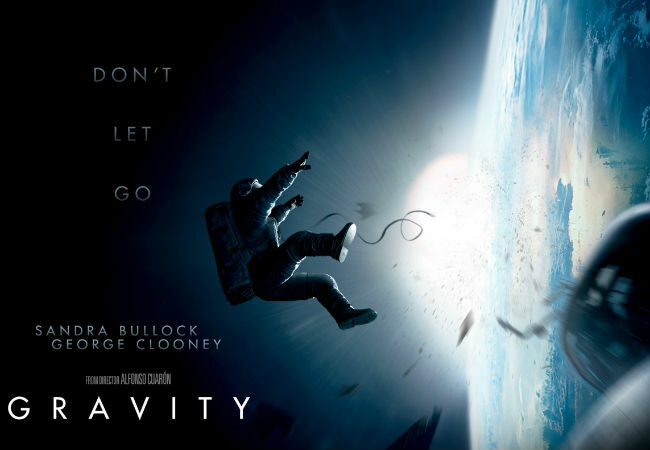 Alfonso Cuarón‘s Gravity brings an outstanding visual treat in connection with an outer space story for the viewers during this movie season. I always do fail whenever I undoubtfully expect and predict the entertainment value and quality at its peak from a movie before its official release. Hence I seriously gave a special attention to avoid it for this time, even after watching its locomotive trailer, a must watch recommendation given by a mate. I was also least bothered regarding the transmission of Cuaron as a director from his other 2 extremely different movies that I’ve seen, a fantasy-magical scripted plot in “Harry Potter and the Prisoner of Azkaban” and “Children of Men“, a dystopian-incisive-science fiction thriller fully based on a few obdurate happenings in 2027. Gravity displays the plot of a shuttle space mission done by Dr. Ryan Stone, a NASA Engineer, accompanied by Matt Kowalski and the very unexpected challenges they were supposed to face during their journey to space. Sandra Bullock (Dr. Ryan Stone) and George Clooney (Matt Kowalski) did their level at its best, more than just ‘best’, for adopting and executing themselves as the major leading roles in the movie. In fact, “The Descendants” actor, Clooney hasn’t had a loopy role to shine throughout the flick, but he had done his sequences including formal humors which could definitely keep the viewers on their seats, especially at the beginning stages. At the same time, if I say, Gravity as a Hollywood movie is made and meant only for Sandra Bullock to hitch it as a milestone in her movie career, I doubt, there is nothing odd in it. Yeah, she did it…! That too, far better than any other actresses who had done movies that came under the same genre before. While coming to the graphics and 3D part of the movie, it’s unconditionally “breathtaking”. If I shall take the top 5 list of the best 3D movies I’ve watched so far, Gravity would be one among them. I wondered at many parts of the movie on which the hi-fi visuals bugged at my eye sights. Since it is a technology related, outer space flick, don’t underestimate the effects which can bring the enormous visuals right in front of your screens. All in all, Gravity is an authentic-experimental-novelty filled overt movie which gives value for your money and time. C’mon..! For whom you’re waiting for now then? Book your tickets at the nearer by theatres soon, watch it, experience the real 3D effect and enjoy it with a packet of snacks. This entry was posted in Movie Reviews and tagged Alfonso Cuarón, Gravity, Gravity Movie Review, Hollywood Movies, Movies, Sandra Bullock. Bookmark the permalink. i absolutely loved the movie. most people told me its slow but i thought that it was worth it. after long a 3D movie that kept me at the edge of my seat 🙂 very interesting. I’m gonna watch this movie tomo.for the 3D and for Sandra Bullock! Great review!